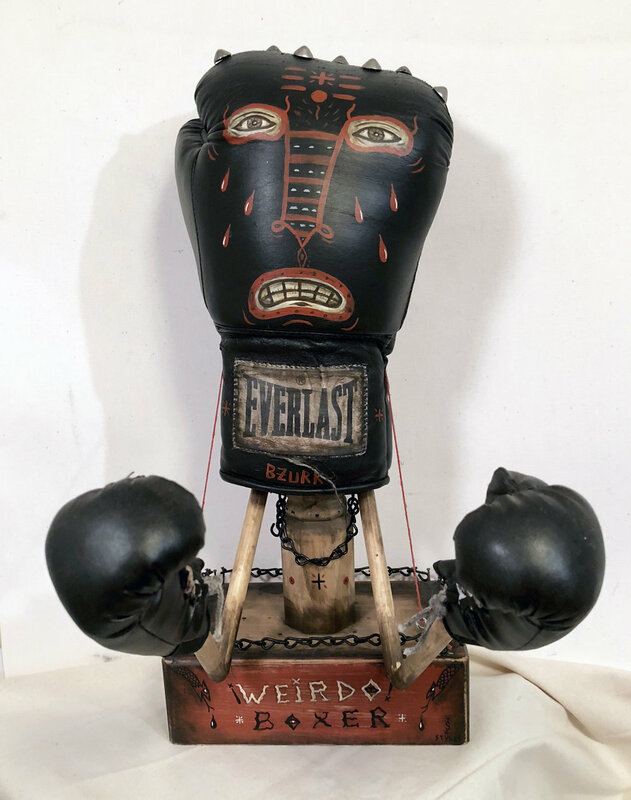 In this month's blog feature, Gallery Director Hannah Reeves asks mixed media artist and October Exhibitor Brandan Styles about the ideas and process behind his intriguing series, Weirdo Spiritualism. HANNAH REEVES: I'd love to know more about why you've chosen the term, "Spiritualism" for your series title, Weirdo Spiritualism. It's clear that your personal philosophy enters into imagery throughout the body of work, but I'm wondering whether "Spiritualism," by connecting to a Victorian-era mindset and a certain notion of occultism, captures more than "philosophy" or "spirituality." BRANDAN STYLES: My art and my outlook/ philosophy I call Weirdo Spirit. Simply put, It is a way in which a Weirdo expresses themselves Spiritually. It is seeing beyond the world of illusions, looking deeper into the surreality of life, its undercurrents, synchronicities, archetypes, and how everything is connected. It relates more to the writings of Carl Jung and Joseph Campbell, than a Victorian mindset per-say. Though the Victorians were certainly on to bringing age old knowledge and wisdom of Occultism to the forefront. Occultism is knowledge of the hidden, and mainly the relation of the cosmos to your own self. And a Weirdo is someone who is innately in tune with the Universal Spirit, and is walking their path to self awakening/ discovery. REEVES: Could you talk about the presence of found objects and found/repurposed wood in your work? How do you decide when to incorporate these materials, and what do you hope they communicate? STYLES: All of the wood in the pieces is literally one of a kind. It has gone through the alchemical process of being found, and then aged in the sun/ elements until an idea is ready for that particular piece. Sometimes a piece of wood really speaks to me and synchronizes almost "magically" with a drawing or idea from my sketchbook. I hope that it communicates that each piece is wholly unique because that piece of wood, through its journey, reached me and I was able to give it life with some idea that captures and unites the two into a whole. REEVES: As the Weirdos seem to be a cast of characters, it's pretty natural to think of them as sharing a narrative. Do you have a story in mind, in which they are all participants? Or are they more separate than that, like patron saints, each with his own purview? STYLES: I have dubbed myself the Patron Saint of Weirdos, and each character has a little bit of me in some form. So, each character is a patron saint/ icon, and they all share a narrative based in my world of the Scorched Earth. The overall story is about these weirdos living in a dystopic paradise, where survival is important, but more important is the spiritual journey through it and to yourself. REEVES: Who or what are your artistic influences? STYLES: I have many artistic influences, as all artists should! From Heironymous Bosch to the Teenage Mutant Ninja Turtles. Robert Crumb to Alejandro Jodorowsky. Religious Icons to Cartoons. Dadaists, surrealists, symbolists, expressionists; anyone with passion for what they do. I've always been drawn to works/ artists who reveal truth and light through a sort of darkness. Music and Books are also prime influencers. REEVES: I always like to ask: What is your studio quirk? STYLES: My studio quirk is to select the right music for the day, light some incense, say a few thank yous, and get down and to it!